I’ve mentioned before how Deas and I prefer to just “wing it” on a lot of our planning. Up until recently, the one and only advance reservation that we made was for Portland, and that was only because we knew we had to be there for my brother’s wedding. We’ve really enjoyed the flexibility of just going where we want, when we want. If we find a place we like, we just extend our trip a few days. 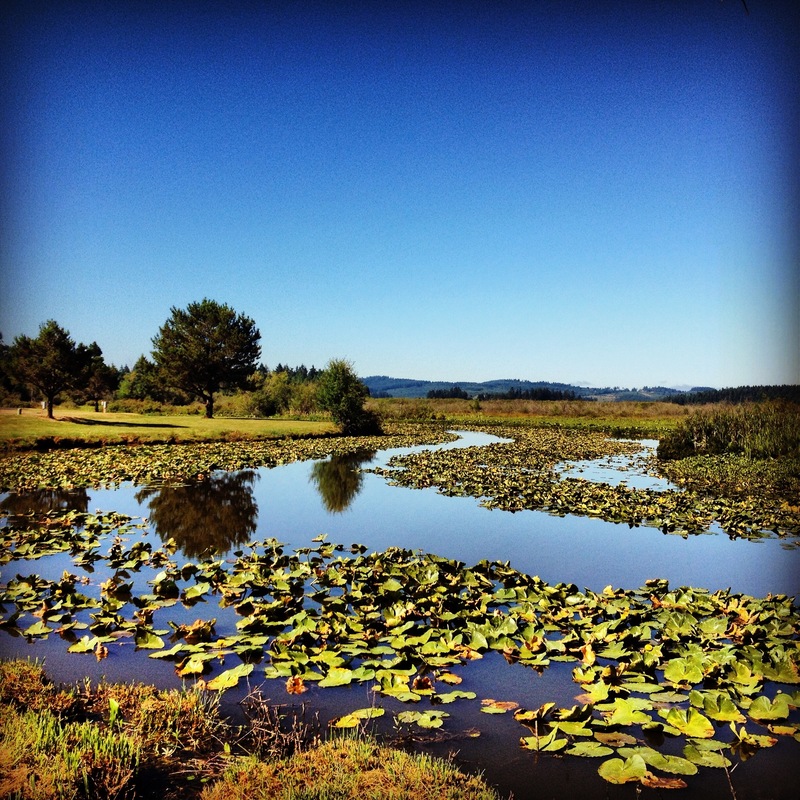 All of this has worked beautifully for us, until we hit Oregon…. 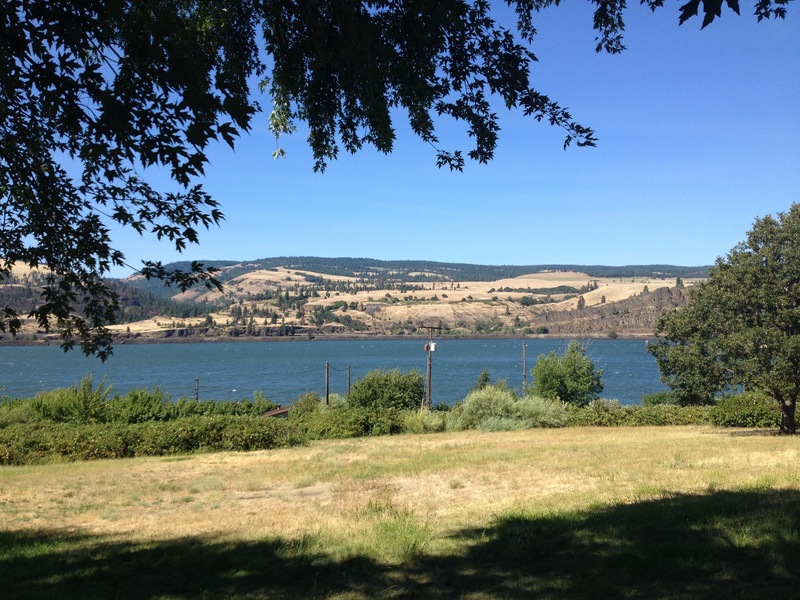 Our first (minor) issue was at Memaloose State Park in Hood River. We decided to stay there for a couple of days after my family all left to fly back to Georgia. We got a two-day reservation easy enough. But after two days, we weren’t ready to leave. We just loved Hood River, and that park. We were able to stay, but we had to move to a different spot, with no electricity or water. But after our two days there, we were able to move back to our original spot with full hook-ups. So on our 5th day, we were getting ready to leave and decided to walk the dogs around the park one last time. Much to our surprise, we spotted a river front site that was open for two more nights. So instead of leaving, we just moved the RV one more time! And we had a great time staying right on the river. Or original plan had been to head down to CA at this point, where we were planning to meet some of our friends from Florida in Napa. But we have a window on order (to replace the one that broke in a bad storm), and it hadn’t arrived yet. Rather than drive down to CA, and then have to return back to OR for the window, we decided to wait for the window to arrive. So we headed over to Washington for a few days. We drove first towards Mt St Helens, and spent a night at the lovely Silver Cove RV Resort in Silverlake. The next day we toured the Mt St Helens Visitor Center, which was very interesting. Embarrassingly, I didn’t take any pictures of Mt St Helens! 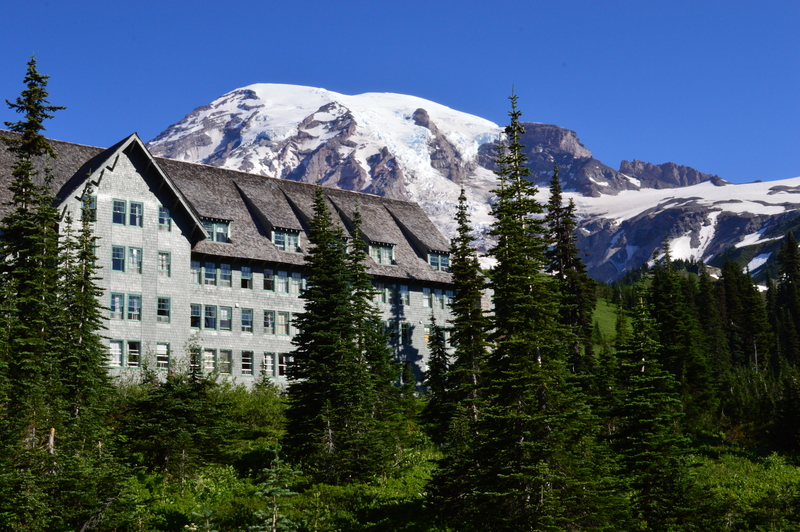 Next we headed towards Mt Rainier National Park. We found that Mt Rainier is NOT very big rig friendly. Once again, of course, we had no reservations, so we had to try to find a spot that could fit our RV. After driving around several loops, trying to fit into one, and then giving up, we finally found a spot that looked like it might work. But it was VERY unlevel, and it took us about an hour and a half to level the RV. Not fun. We tried to move to a different campsite the next day, but our RV was too big, so we left Rainier on a Friday afternoon with no campsite reservations. (On a side note, Rainier was pretty, but not overly impressive. Not sure we’ll go back in an RV.) After a couple of hours of making phone calls, driving down a few dirt roads looking for a boondocking spot, and general frustration, we finally found a spot at the Washington State Fair campground. It was packed due to an antique car show, so we were squeezed in between other RVs, but we were just grateful to find a place to stay! So once we realized we were going to stay in Oregon for awhile, I then realized that our general style of floating from place to place on a whim was not going to work during such a popular season for the coast. The stress of not being able to find a campsite the previous Friday convinced me to take on the stress of planning out our stays for the next few weeks. I relied heavily on the reviews/experiences of a great blog that we follow, Wheeling It. Paul and Nina have spent lots of time in Oregon and I found some great information on their site. So, long story short, our plans for August have completely changed, and even though we’ve got some good stuff planned, I’m really disappointed to miss our friends in Napa. We’ll still hopefully get down there eventually. 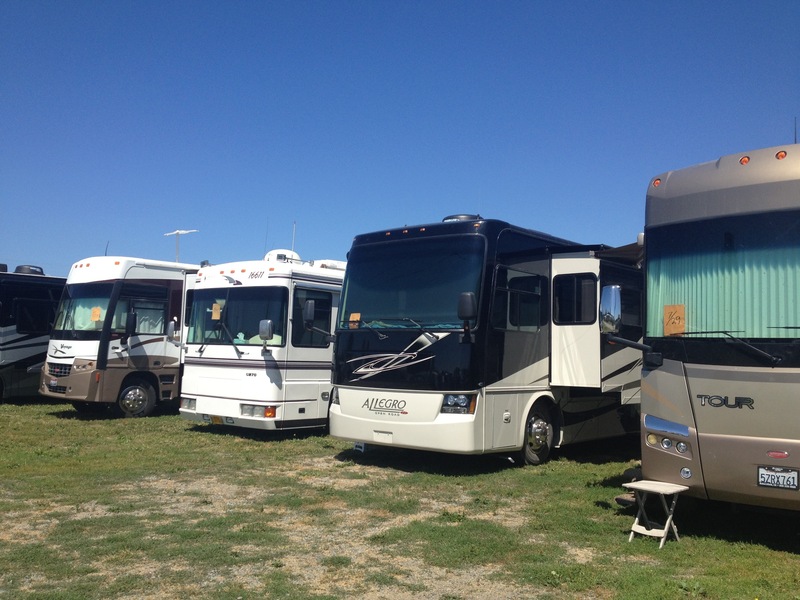 Excellent blog post that covers many of the “unexpected” sides of RVing. Thanks also for the plug! I enjoyed reading your blog post. Bob and I have had the same frustrations about not having made a reservation in high use areas. I would like to add a note about your experience at Mt. Rainier. As you have discovered and shared for others who may follow in your footsteps, the National Park campgrounds were not designed for and most will not accommodate “Big Rigs”. Thank you for sharing that info. As far as your comment about Mt. Rainier not being overly impressive, I would like to emphasize that “beauty is in the eye of the beholder”. In my humble opinion Mt. 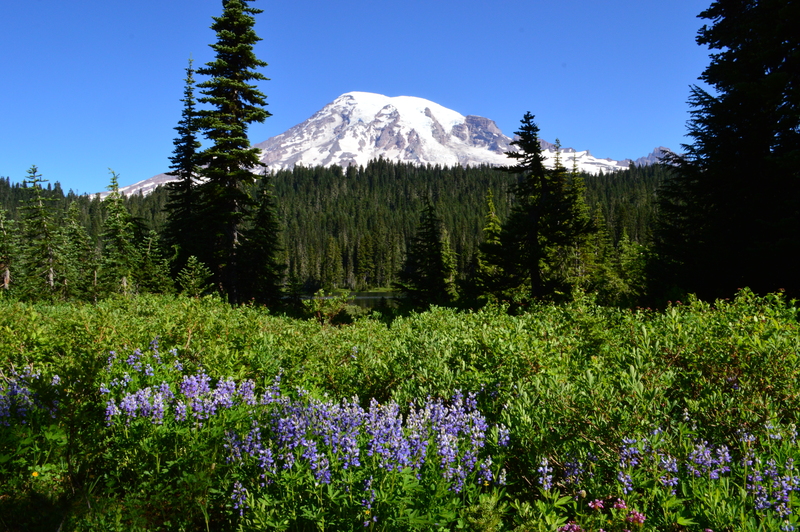 Rainier is the most beautiful, amazing, and impressive National Park in the system. We were lucky to find a campsite at Cougar Rock CG where our 35′ MH fit with a little bit of extra effort. It is unfortunate that you were not able to find a suitable campsite that would allow you to experience all this beautiful park has to offer. Again, thanks for the post. We did stay at Cougar Rock the first night, it was the second night that we couldn’t find a spot. I don’t mean to say that Mt Rainer wasn’t pretty, because it was. I just felt that we enjoyed Yellowstone and Grand Tetons more. Also, I think by that point I was ready to leave the mountains and head to the beach. The other factor for us was that we currently don’t have a tow vehicle, so we had to drive around the park in our MH. And those roads are very twisty and curvy! If we had more time, and if we had a car, our experience probably would have been different. Thanks for following along and for the comment! Uggh I can’t even imagine going through Mt. Rainer National Park in a motorhome. I thought I was going to die when we went there years ago in our van with my poor Mother in Law who closed her eyes the whole time. I haven’t been to Mt. Rainer since. I guess I am overdue for a visit now. Yes, driving through Rainer in a motorhome is far from ideal! On the second day we started driving up to Sunrise, and halfway there I made Deas turn around. I simply couldn’t take being jostled around on the bumpy roads and all of the twists and turns we were having to endure. If we ever go back we’ll definitely need to have a car with us! Hello from your neighbors down the hill at Emigrant Lake. Re: to plan or not to plan. We tend to try to stay in a park for a week or more in high demand locations so making reservations is imperative, especially during the summer. For example, I tried to make late September reservations for the North Rim of the Grand Canyon five months in advance and couldn’t get a site. Another example, I called for reservation at 3 parks near Anacortes, WA about two months in advance – no dice. On the other hand, over planning can be so limiting. Hope you continue to have wonderful travel experiences. I’m planning a roadtrip in the US in May and was planning to just wing it every night. But after reading about the most popular places being fully booked already, I decided it wasn’t the best idea. I guess if you don’t have any specific places you want to stay at, then it would be alright. But since we have lots of plans on where to go on our limited time, it’s just not worth not knowing if we’ll be able to stay where we want each night. I think you’re right. It sounds fun and adventurous to just wing it, and it can be….but it can also be stressful. Doing all the planning/making reservations in the beginning will take a lot of stress out of the trip, especially if this is your first big trip. I hope you have a great time!